Nelvana of the Northern Lights by Adrian Dingle to be reprinted. Some news announced at the 2013 Joe Shuster Awards ceremony and reiterated the following day at Fan Expo Canada — Hope Nicholson and Rachel Richey (who were both involved in Lost Heroes the Movie, which is said to be released later this year) have received permission from Corus Media and the National Archives to reprint the 31 Nelvana stories. Richey, who has worked for the National Archives in the past, has a blog on Canadian comics entitled Comic Syrup. The character was published from 1941-1947 in the pages of Hillborough Studios and later Bell Features’ Triumph-Adventure Comics. 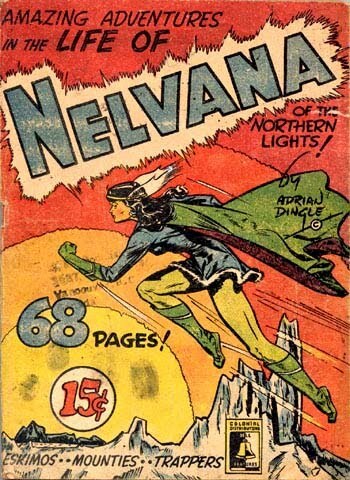 Nelvana is one of the medium’s earliest female superhero characters. Nelvana was created by Canadian Comic Book Creator Hall of Fame Inductee Adrian Dingle in 1941 for his company Hillborough Studios, after hearing tales of Inuit legends by well-known Canadian painter Franz Johnston. After merging his Toronto studio with publishers Gene and Cy Bell’s Bell Features, Dingle officially signed over the rights and trademark to Bell Features in a 1946 dated document. However in 1947 Bell Features sold the rights to Nelvana and other characters to F.E. Howard Publications, and Nelvana’s last appearance in comics (still written and drawn by Adrian Dingle) was in F.E. Howard’s Super-Duper Comics #3 (May-June 1947 issue), which won’t be included in this collection. While Bell Features/Commercial Signs of Canada closed up shop in 1953, the original artwork and the publication rights to the Bell Features Comics (incl. presumably the Hillborough Studios issues) were sold to Michael Hirsh and Patrick Loubert in 1971 by John Ezrin, Bell’s former Capital Officer. They in turn donated the collection to the National Archives under the provision that the material could not be reprinted without their permission. Their company Nelvana, was named after Dingle’s character, which was bought by Corus Entertainment in 2000, and presumably that includes the company’s assets – including the publication rights to Bell Features comics. So this could be just the first re-presentation of Bell Features comics, providing that this one is successful. The majority of these comics have not been seen since they were originally published in the 1940’s. Some scans have been reprinted in books such as Hirsh and Loubert’s Great Canadian Comic Books. Nelvana was featured on a postage stamp. Inspired by tales of the Inuit people told to him by Group of Seven and Ontario College of Art professor Franz (or Frank) Johnston, creator and cartoonist Adrian Dingle loosely adapted many Inuit legends into the superhero mythology of Canada’s first female superhero, predating the arrival of Wonder Woman by less than a handful of months. When asked about potential new comics featuring Nelvana of the Northern Lights, someone on the facebook group for the character indicated that permission for any NEW comics with the character would require the permission and involvement of Adrian Dingle’s estate, that is until 2024 — our research indicates the date is specifically January 1, 2025 (as Dingle died in 1974 the copyright act indicates that the control of the artist’s work falls to his or her estate for 50 years after the death of the artist/author up until the end of the calendar year in which they passed away). At that time, presumably Nelvana becomes a public domain character. We’re not entirely sure where F.E. Howard Publications fit into this mix – they bought the rights to Nelvana with the intent to create new comics from Bell in 1947, and the 1971 agreement would indicate that Hirsch and Loubert obtained just the reprint rights to those stories published by Hillborough/Bell Features. The creation rights may have had a specific time limit, or conditions that were not met, but at the latest they likely lapsed back to the Dingle Estate in 1997 (50 years after they were licensed). The Dingle Estate has always controlled what Canadian copyright law refers to as the Moral Rights to Nelvana, and can veto depictions of the character they don’t agree with if they so choose. Nicholson and Richey announced that the project would be crowdfunded (probably by either Kickstarter or Indiegogo) with the campaign to begin on October 1, 2013. The collection we are told will be priced at $30, in softcover trade paperback format. Black and white interiors, with a colour cover. Book design for the project is being handled by Joe Shuster Award winning cartoonist Ramon Perez (Jim Henson’s A Tale of Sand). Perks are to be announced, but many artists such as Jeff Lemire and Steve Manale have been announced as providing something for the project, and others such as David Cutler and Adriana Blake have done art pieces of Nelvana that will presumably be perks or turned into prints or other media for perks. For updates and interaction with the editors, please check out the facebook page. This entry was posted in Blogosphere, Canadian Heroes, Crowdfunding, General Announcements, General News, Hall of Fame, Publishers by Kevin A. Boyd. Bookmark the permalink.